EN Summary: Things have been slow this week on the sewing front; my son has been sick and I don’t know about you guys, but when that happens my sewing mojo goes down the drain. 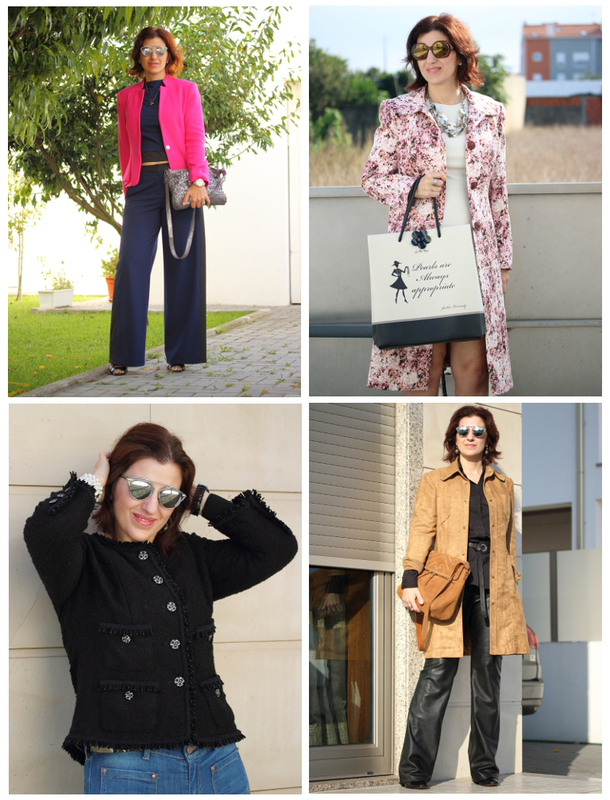 There hasn’t been much time for outfit posting on my other blog either it has been slow for a couple of months now,… Nevertheless I’d like to share a few outfits that were published there, which incorporate self-made garments. Continue reading for more details and links to the corresponding sewing reviews. PT Sumário: As coisas na costura têm estado paradas esta semana; o meu filho está doente e não sei como é com vocês, mas comigo tira-me logo a vontade de fazer seja lá o que for. O meu outro blogue já anda meio parado há mais tempo mas alguns dos conjuntos que foram sendo publicados incluem roupas feitas por mim e achei que gostariam de os ver. Continuem a ler para verem mais detalhes e para links dos respetivos artigos de costura. EN: I wore this outfit in mid-August and both the top and the pants were made by me. Before you ask, he bright pink ponte jacket was purchased during the summer sales and it’s very similar to a jacket that I made years ago (which doesn’t fit anymore, I gave it to a dear friend). Click here for more photos of this look, click here for the top’s sewing review and click here for the pants sewing review. PT: Usei este conjunto em meados de Agosto e tanto o top como as calças foram feitos por mim. Antes que perguntem, a jaqueta rosa-vivo foi comprada nos saldos de verão; tinha uma semelhante feita por mim, mas agora está-me grande e ofereci-a a uma amiga. Cliquem aqui para mais fotos deste conjunto, cliquem aqui para o artigo de costura do top e aqui para o artigo de costura das calças. EN: You all know this coat by now, my flower print version of BCN Unique’s Cassock coat. I love it so much that I intend to make a winter version, just wait for it! Click here for more photos of this look and here for the sewing articles. PT: Já todos devem conhecer este casaco, é a minha versão às flores do casaco Cassock de BCN Unique. Gosto tanto dele que tenho planeada uma nova versão de Inverno, me aguardem! Cliquem aqui para mais fotos do look e aqui para os artigos de costura do casaco. EN: My Little Black Jacket (Chanel inspired) is still fresh in my readers memory but in case you missed it, click here for the sewing review and here for more photos of this look. PT: A minha Little Black Jacket inspirada em Chanel ainda deve estar fresca na vossa memória mas para o caso de não terem visto, cliquem aqui para p artigo de costura e aqui para mais fotos deste look. EN: This last look was worn a few days ago and features a faux suede 70s inspired coat that I made back in April. Click here for the sewing articles and here for more photos of this look. Thank you all for visiting! PT: Este último conjunto inclui um casaco de imitação de camurça inspirado nos anos 70 que fiz em meados de Abril deste ano. Cliquem aqui para os artigos de costura e aqui para verem mais fotos do look. Obrigada por aparecerem! Your garments are always so fantastic. I don't comment much but want you to know I always read and admire your work. Guapísima como siempre.! Espero que tu hijo se recupere pronto. ¿ qué tal va la chaqueta? Gracias Pilar! No he costurado nada desde el finde,... Me queda el "quilting" por terminar, después dar forma al cuello, pulir vistas, etc. Besos! You have really proved that old Burdas should never be thrown away. I don't have them back quite that far, but I have gone back quite a few years on occasion. I love the coat as well as everything else. You are such an inspiration and an example that if you sew carefully and with thought and patience, the results can be truly rewarding.